An eyewitness said she heard "a crackling" noise before the collapse at about 20:15 GMT. Another eyewitness said the "entire dome roof" fell on audience members seated in the stalls. London Ambulance said there were 30 casualties including walking wounded. 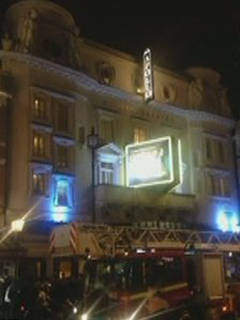 London Fire Brigade said eight fire engines were attending and police are also at the scene in London's busy Theatreland. Witnesses said they saw people leaving the building, covered in dust and debris - with some people bleeding and crying. Amy Lecoz, who was at the theatre with her two children, aged 16 and 19, said: "The entire dome roof fell down on the audience just in front of us. "We were protected by the balcony above and we ran. People started screaming. "We thought it was water... We thought it was a part of the show. I grabbed my kids and ran." Another witness said she heard a "strange crackling noise" before "the roof just crumpled". The theatre "suddenly went dark" with "dust clouds everywhere", she said. "You could see everyone ran off the stage... it went dark". The witness said police and emergency crews were at the scene within minutes. A 29-year-old audience member, who only gave his name as Ben, said: "It was about halfway through the first half of the show and there was a lot of creaking. "We thought it was part of the scene, it was a seaside scene, but then there was a lot of crashing noise and part of the roof caved in. "There was dust everywhere, everybody's covered in dust. We got out fairly quickly, I think everyone was quite panicked." The Apollo was built in 1901. It is owned and operated by Nimax Theatres and has 775 seats over four levels. Jess Bowie was also in the theatre and said in a tweet that the experience was "absolutely petrifying... people outside are covered in dust and some in blood. Utterly horrible". The Curious Incident Of The Dog In The Night-Time has been running in London since August 2012. The show started at The National Theatre, before transferring to the Apollo in March this year.